The last case of polio in India was reported on 13 January 2011. The United Nations World Health Organization (WHO) today certified as polio-free 11 countries in Asia that together are home to a quarter of the global population. Bangladesh, Bhutan, Democratic People’s Republic of Korea, India, Indonesia, Maldives, Myanmar, Nepal, Sri Lanka, Thailand and Timor-Leste constitute WHO’s South-east Asia Region. This is the fourth of six WHO regions to be certified, marking an important step towards global eradication of polio – a highly infectious virus that attacks the nervous system and can cause total paralysis in a matter of hours. 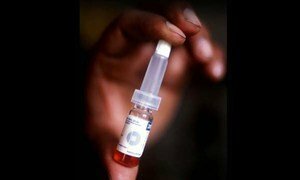 With this step, 80 per cent of the world’s population now lives in certified polio-free regions, the health agency stated in a news release. “This is a momentous victory for the millions of health workers who have worked with Governments, non-governmental organizations, civil society and international partners to eradicate polio from the region,” said Poonam Khetrapal Singh, Regional Director for the WHO South-east Asia Region. Before a region can be certified polio-free, several conditions must be satisfied, such as at least three years of zero confirmed cases due to indigenous wild poliovirus; excellent laboratory-based surveillance for poliovirus; demonstrated capacity to detect, report, and respond to imported cases of poliomyelitis; and assurance of safe containment of polioviruses in laboratories. WHO noted that polio eradication programmes, through their networks and knowledge in reaching the ‘unreached,’ have strengthened the delivery of health services to the most vulnerable communities. Through the effort to eradicate polio, health personnel and community workers have been trained and provided with critical equipment to improve vaccination and health services for other childhood diseases. Comprehensive global laboratory and communication networks have been built and are being used for other diseases, including most recently to respond to avian influenza. While celebrating the historic achievement, Dr. Khetrapal Singh also sounded a word of caution to maintain high vigilance against importation of polio. “Until polio is globally eradicated, all countries are at risk and the region’s polio-free status remains fragile,” she said, adding that a sensitive surveillance system, able to quickly detect and identify any importation and guide a programmatic response, is critical. The world is closer than ever to eradicating polio, the United Nations World Health Organization said today while warning that children continue to be at risk, particularly in the Horn of Africa where a tapering outbreak has been confirmed, and amid reports of suspected cases in Syria.